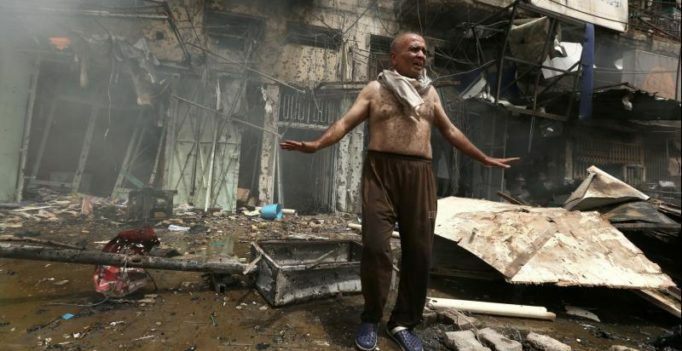 Baghdad: Militants on Monday unleashed a series of attacks in Shiite-majority neighborhoods in the Iraqi capital, Baghdad, killing at least 15 civilians, officials said. Another suicide attacker on foot blew himself up among shoppers in the eastern neighborhood of Mashtal, killing five civilians and wounding 15 others, another police officer said. Three more civilians were killed and 10 wounded in a bomb explosion in a commercial area in the northern Sabi al-Bor area, police added. No group has immediately claimed responsibility for the attack. The extremist Islamic State group has claimed similar attacks in the past. Despite a series of battlefield defeats in recent months, the group still controls key areas in Iraq, including the northern city of Mosul. The Iraqi government is preparing to launch a major military operation, with air support from the US-led coalition, to retake Mosul this year. As it has lost territory, ISIS has increasingly turned to insurgent-style attacks away from the front lines in an attempt to distract security forces and undermine government efforts to maintain security. Violence claimed the lives of at least 1,003 Iraqis last month, including 609 civilians, according to the UN Assistance Mission to Iraq, known as UNAMI. At least 1,159 people were wounded in September.